This Sparkling Fizz 30th Birthday flag bunting measures 3.9m long and displays 11 flags along the length, each flag is decorated in sparkling gold and silver holographic colours on a black background. 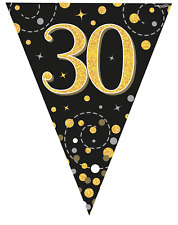 The flags feature polka dots, sparkles and swirls surrounding a big number 30 to celebrate the big day!. This Sparkling Fizz 80th Birthday flag bunting measures 3.9m long and displays 11 flags along the length, each flag is decorated in sparkling gold and silver holographic colours on a black background. 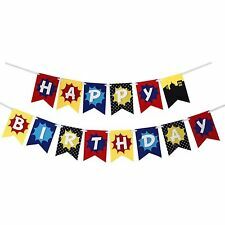 The flags feature polka dots, sparkles and swirls surrounding a big number 80 to celebrate the big day!. This Sparkling Fizz 16th Birthday flag bunting measures 3.9m long and displays 11 flags along the length, each flag is decorated in sparkling gold and silver holographic colours on a black background. The flags feature polka dots, sparkles and swirls surrounding a big number 16 to celebrate the big day!.